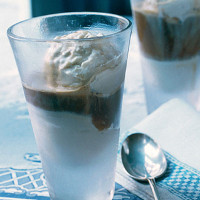 Meaning 'drowned', this grown-up ice cream sundae is served in most Italian coffee houses, though it is originally Milanese. You could crumble some amaretti over the top, but it's just as delicious when it's left absolutely plain. Place 4 tall, shatterproof glasses in the freezer. When they’re frosty, scoop top-quality vanilla ice cream into them. Pour a shot of espresso over each one and serve at once.